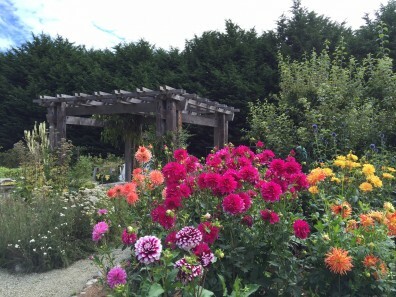 Two demonstration sites are maintained by Clallam County Master Gardeners. At each of these sites, the community can see firsthand the types of plants that grow well in our area, and learn recommended planting practices and overall garden care. Visitors can also enjoy each garden’s unique beauty and large variety of ornamental plants, vegetables and fruits. The Woodcock Demonstration Garden is located at 2711 Woodcock Road in Sequim, WA. The garden demonstrates a broad range of ornamental and edible plants, native gardening, composting, and garden design. The extensive organic vegetable display area includes examples of vegetables that grow well throughout the year, and demonstrates growing techniques and tools that will help you get the most out of your home vegetable garden. Gardens also include perennial, herb, tree fruit and berry displays. The Woodcock Demonstration Garden has a classroom and an outdoor pavilion where Plant clinics, free lectures, and workshops are held from May through October. See the Woodcock Education Schedule for more details. If you would like to ask a Master Gardener questions about the garden, visit us on Thursdays from 10am-12pm or Saturdays from 9:30am – 12:30pm during the summer months. The 5th Street Community Garden is located at 328 E. 5th St. directly across from Port Angeles City Hall. Master Gardeners maintain four vegetable demonstration plots that showcase vegetable varieties that work well in our climate. Community members can find innovative ways to extend the growing season and grow more warm season vegetables in our cool climate, and low impact ways to improve soil and plant nutrition. If you would like to talk to a Master Gardener about their vegetable plots, work parties are scheduled on Mondays from 10am – 12pm throughout the summer months. Master Gardeners also lead educational “Second Saturday Garden Walks” which are held on the second Saturday of each month from April through September.